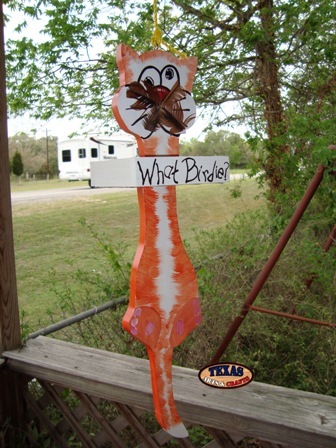 We hand make the What Birdie Bird Feeder. The bird feeder is built in our workshop out of pine. 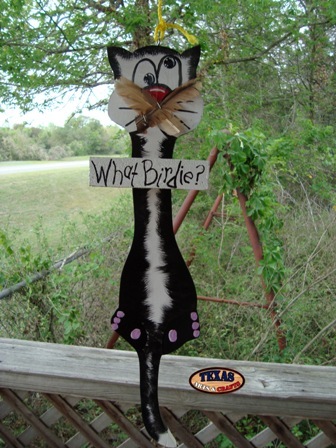 The cat is hand painted with Kilz House Paint. There are three options for the color of the cat gray and white, black and white, or orange and white. The size and colors may vary slightly as it is hand crafted. The feathers are chicken feathers that our chicken flock leaves around from time to time. The tray is made from screen wire. Some of the birds that will be attracted to the bird feeder are the American Kestrel, the Great Crested Flycatcher, Wrens, Chickadees, Nuthatches, Titmice, Swallows, Blue birds, Mockingbirds, and Woodpeckers. For more information about these birds go to Backyard Birds, Blue Birds, and Purple Martin Birds. The dimensions are 25 inches tall by 6 inches wide by 6 inches deep. 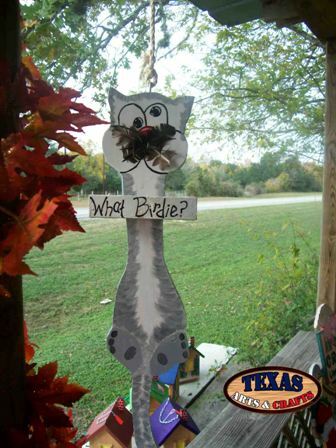 The bird feeder weighs approximately 3.50 pounds with packaging. For the continental U.S. shipping and handling is included in the listed price. For shipping outside the continental U.S. please contact us through our Contact Us page.